So Much work and we love it. Myself and Spencer have had a massive journey from selling a property in the city to getting plans set up and three quarters of the way through planning to build our own home together. We have had so many massive mountains to climb through that period. To then find ourselves up against the Environmental agency that would not compromise and see a little of what we classed as common sense. Giving us no choice but to pull out. Things are meant to be and so came along Cornerways our beautiful (well not at the moment) over 150 year old stone cottage in the village of South Brent. Such a lovely way to wake up with the sound of the birds instead of sirens and traffic. If you follow me on Instagram you would have seen a little preview of what we have been up to so far with regards to restoring this lovely house to its former glory. If you don’t then I am going to be doing a blog on every step of the journey until we have finished. Here is a little to start us off. We have decided to camp in what will be the kitchen and start with the upstairs.first. Luckily there is kind of a kitchen we need to get a cheap electric oven to see us through and there is a shower downstairs so not all the bad. However living in one room will be an exercise in itself. We are saving one room upstairs for Spencer’s son to stay in when he visits. So this is the room that we will be camping in and making our bedsit, but this will eventually be the hub of the house and a great size kitchen. The ceiling has been boarded over and as you can see is starting to hang down a little. There is roughly about 30 cm more height and we are hoping to discover some more beams that have been hidden. So enough about downstairs I will show you more when we have nearly completed the upstairs. We have four bedrooms upstairs and a family bathroom. Each bedroom is a great size and all doubles. We have chosen the master bedroom which is located at the front of the house. Due to the lovely view of the moors out the back bedroom we have decided to knock through and give the master bedroom dual aspect views. One at the front of the house and the other is the Moor view at the back, as my daughter Georgia and Spencer pointed out the views are too good not to be able to look at from the master bedroom everyday. We checked with the estate agent that we wouldn’t be losing value taking it from a Four to a Three and luckily we won’t. The images above show the front part of the Master bed. So as you can see the front part of the master bedroom as got some strange en suite that has clearly never been used. Or even finished for that matter. Not sure when it was started maybe the 80’s due to the Olive Green suite that was in place. On the other side is a pretty small cupboard, This needed to be ripped out. 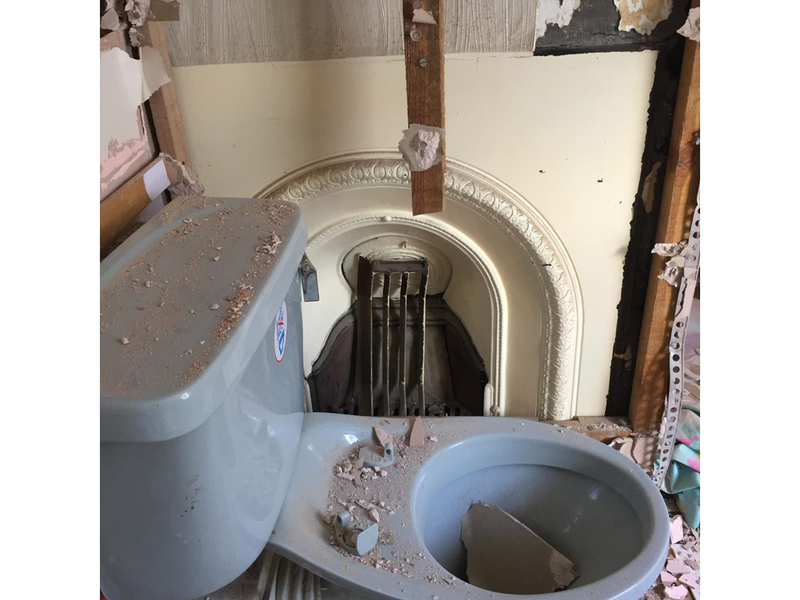 Once we ripped out the cupboard and the en suite, we uncovered the fireplace which had been hidden away. A bit of paint stripper will bring this little beauty back to a lovely old feature. As well as uncovering the old stone wall above and around the fireplace it should bring some nice character to the bedroom. The wall we are going to be knocking down is the wall on the left in the above photo. This will then knock through to the room pictured also above with the awful boxed in wooded window sill. Giving it the dual aspect view. So the two doors you see in the below picture will turn into one door. Oh those awful slated doors a now a thing of the past and well and truly ripped out. That’s it for now folks will be back soon with more developments. Looking forward to knocking the rest of the wall down this weekend.